Rotator cuff injuries are a common complaint that we treat often at Mountain Health & Performance. Though, no two people are the same, patients presenting with rotator cuff injuries commonly have poor shoulder strength, scapular stability and or poor thoracic, cervical and scapular mobility. The shoulder is a complex joint to treat because is influenced by the neck, upper back, scapula, AC and SC joints. Dysfunction in these areas will place stress and strain on the rotator cuff in different ways; therefore it’s critical to correct any strength or flexibility problems in these areas in addition to treating the rotator cuff (the site of pain). The rotator cuff is a group of 4 muscles (infraspinatus, supraspinatus, teres minor and subscapularis), which surround the shoulder. 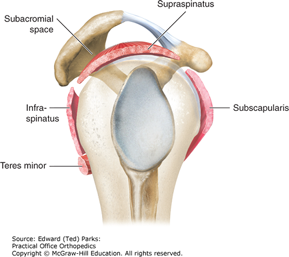 The supraspinatus primarily abducts the shoulder (moves it out to the side), the infraspinatus and teres minor externally rotate the shoulder, and the subscapularis internally rotates the shoulder. The rotator cuff also keeps the shoulder joint centrated. This means that the cuff acts to keep the head of the humerus stable and moving well within the socket of the shoulder joint and is a very important function! The rotator cuff can be injured in many ways but typically injury is due to repetitive strain (work and activity) and further exacerbated by shoulder, neck and upper back dysfunction. 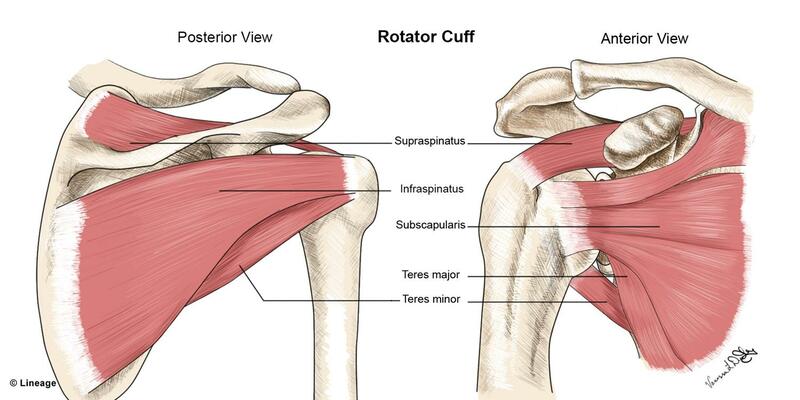 Patients with rotator cuff problems may present with shoulder pain that is on the front, side or back of the shoulder. The patient may also have pain into the deltoid region, lower down on the shoulder. This does not mean that the deltoid muscle is the problem; this is a common location for rotator cuff referred pain and may not be an area that requires much treatment. As I have stated before, the site of pain is not always where there is true dysfunction. Sometimes it may feel good to ‘rub the boo boo’ or to receive treatment over the area of pain but if it doesn’t get better in the long-run then you are not getting to the root of the problem. 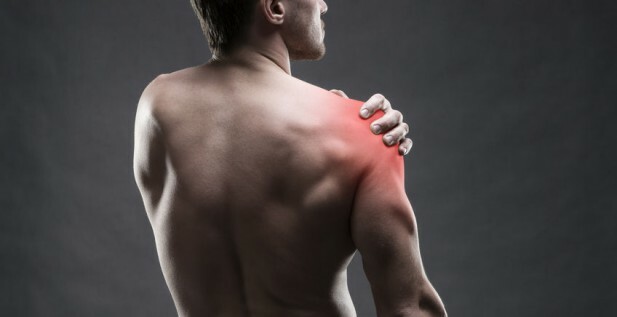 The shoulder may be painful at rest but is typically aggravated in certain positions. The most painful positions are with the arm overhead (abduction and flexion) or with the arm behind. Pain can be dull, achy, sharp or shooting. The rotator cuff muscles become tendons as they insert onto the humerus (arm bone). As they insert onto the bone they pass under the top part of the shoulder through a relatively small space called the subacromial space. As you move your arm and shoulder overhead the space for the rotator cuff tendons naturally will decrease. In a well functioning shoulder this is not a problem but any dysfunction around the shoulder or of the shoulder itself could decrease the space for the rotator cuff tendons and lead to irritation. Over time this irritation will lead to inflammation and subsequent degeneration of the tendons. Most people with rotator cuff problems are at the stage of tendinopathy NOT tendonitis; the latter infers inflammation. This means that the inflammatory phase has long passed and there is a certain amount of degeneration that has occurred within the tendon itself. This is also why most of the time rotator cuff tendinopathy also includes a certain amount of impingement and the two diagnoses may be used somewhat interchangeably. Below I have listed some of the most common reasons patient’s come to Mountain Health & Performance with rotator cuff pain and injury. This is not an exhaustive list and no two patients are the same, these are merely common trends that I observe within my own patient population. Weakness of the rotator cuff or any of the individual muscles is a common issue. As I mentioned above, the rotator cuff acts to centrate the shoulder joint and keep it stable. Therefore if the cuff is weak it may allow the humerus to ride upwards, decreasing the space for the rotator cuff tendons and leading to irritation and injury. Strengthening the rotator cuff muscles is an important part of rehabilitating a rotator cuff injury. It’s important to note that this should always be done under the supervision of a healthcare provider. It’s critical to use the correct exercises and to progress them at the right speed to avoid aggravating the injury. There is no cookie-cutter approach to rehabilitation and anytime exercises are given for a specific problem there should be an assessment, diagnosis and treatment plan initiated first. Weakness in the muscles that stabilize the scapula (the shoulder blade) can also create dysfunctional mechanics at the shoulder. The lower trapezius, rhomboids and serratus anterior are important muscles to strengthen in order to prevent and or treat rotator cuff problems. It’s important for the shoulder (glenohueral joint) to have the appropriate range of motion in addition to strength. I typically describe mobility as a combination of strength + flexibility but since we already discussed the importance of strengthening the rotator cuff it’s also important to mention having the proper range of motion. Most of the exercises I prescribe are mobility exercises meaning you strengthen the tissues while improving range at the same time! If you don’t move the shoulder joint through it’s full range on a regular basis then the muscles surrounding the shoulder (including the rotator cuff) may start to stiffen up and limit mobility, placing increased stress and strain on certain muscles and tendons. Previous injuries and conditions (dislocations, fractures, frozen shoulder etc.) can also lead to scar tissue formation and contribute to limited mobility around the shoulder. Most people with chronic shoulder pain will have limited mobility that requires soft-tissue release of the muscles, tissues and fascia along with regular at home strengthening and stretching. All of the chiropractors at Mountain Health & Performance preform soft-tissue/myofascial release if a patient’s shoulder pain is related to a soft-tissue mobility problem. Common techniques used are called FR (functional release) and ART (active release technique). Limited mobility at the cervical spine, thoracic spine and scapulothoracic joint. It’s also really important to have good mobility in the above regions. If the body doesn’t have enough mobility at a specific joint it will tend to search for that mobility in the joints above and or below. For instance a lack of mobility in the thoracic spine can lead to increased stress and strain being placed on the shoulder and rotator cuff. Mobility drills targeted at the affected hypomobile joints (usually the neck and upper back) are typically part my patients shoulder rehabilitation programs. Adjusting those regions in the initial stages of rotator cuff injury is also a great way to get fast improvements in the mobility of these areas. Most of us spend most of our time with our thoracic spine in flexion (slumped forward), our chin poking out and our shoulders rolled forward. In this position our scapulae (shoulder blades) are also protracted apart. With our shoulders in this position we decrease the amount of space for the rotator cuff tendons even further. 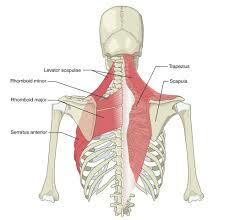 To maintain upright posture we need thoracic extension along with scapular retraction. Because we rarely use these ranges most of us have a hard time actively moving into them and this makes it even more difficult to maintain good posture. It’s important to re-establish this good mobility so that we can maintain a comfortable posture throughout the day. It’s also important to note that perfect posture itself cannot be trained at the gym or afforded to your by a specific treatment; it must be consistently thought about and corrected throughout the day. Therefore, it’s important to know how to cue yourself for proper posture. A good cue for posture is to bring your shoulder blades down and around the spine. You should feel some activation through the muscles on the lower part of the shoulder blades and it should be a comfortable, natural looking posture. Another great way to cue yourself to maintain good posture throughout the day is to use Kinesiotape. With many patients I will place two strips of the stretchy tape between the shoulder blades to provide feedback or a reminder to maintain better posture. When you slump forward the tape will stretch to remind you to sit up straight! As you can see the shoulder is a complex region of the body and though there are many common trends with rotator cuff injury it’s important to seek the advice and treatment from a healthcare provider to ensure proper diagnosis and healing. If you have shoulder pain it is not necessarily a rotator cuff problem. Referred pain from the neck, upper back, bursitis, thoracic outlet syndrome (to name a few) or even something more serious could all create pain in this area. This is why a specific diagnosis is so important. A combination of soft-tissue work, adjusting, stretching and strengthening is extremely effective at treating rotator cuff injuries but should always be done under the guidance of a professional to ensure that the cuff is not aggravated during the initial stages of healing. At Mountainhealth and performance we also utilize class IV laser which is a therapeutic tool used to decrease inflammation and speed healing. Using the laser in conjunction with manual therapy and rehabilitation provides fast results for both acute and chronic shoulder and rotator cuff issues.